The first team are back at Palmerston on Tuesday evening when we welcome Morton in the Championship. While we enjoyed a two - nil home win over bottom side Falkirk on Saturday and moved into fourth place in the table, the visitors suffered a heavy defeat, five - nil away at Ross County. Games between the two sides are often tight and our earlier meeting this season finished all square at Cappielow. Callum Semple and Josh Todd both scoring to give us a share of the points as we came back from two down. Queens boss Gary Naysmith happy with the way things have gone in our last two games is hoping we can extend the winning run to three games. "It was a very professional performance from the players against Falkirk on Saturday. The first 45 minutes were pretty even and sometimes you can think that maybe it's not going to be your day when you miss a penalty but fortunately for us that wasn't the case. I asked the players at half-time to try and up our attacking threat and go out and make sure that we got the three points and that's exactly what they did. I like the way that we have a habit of scoring quick consecutive goals. If you look at our record this season it shows that when we got one goal we often get another quite quickly and that's a good habit that I hope we can continue. It was also nice to see us keep another clean sheet and that is now six in ten league games which is excellent. I also think that it's been important in the last two games to show that we are not solely reliant on Stephen to score goals to ensure that we win a game. Stephen hasn't scored in the last two games but we have still managed to take six points although I am hoping that his two match goal drought doesn't go on much longer! It's been a quick turnaround with the two games in four days but when you're winning games that's what you want and we were back in on Sunday morning to recover and start preparations for Morton. We know they will be looking to bounce back from Saturday's result. They have experience within the squad with players like Michael Tidser, Chris Miller and Jim McAllister so they know how to move on from disappointing results and I'm sure they will all be out to show the manager that it was a bad day at the office. There is still a doubt over the fitness of both Adam Frizzell who injured his ankle in the half-time warm up on Saturday and Scott Mercer who came off near the end with a back problem. Gavin the physio has been working with both to get them ready but we will have to wait and see. Gary Harkins is still a week or two away yet so won't be available and Darren Brownlie continues his rehab". Visiting fans should note that section six of the BDS Digital (East) Stand has been set aside for them and that they should use turnstile three to gain entry. The catering outlet and toilets in the BDS home side will be available for use. Catering is also available in the Arena café where a full menu is available before kick-off. The bar under the Gates Stand will also be open for refreshments. Admission is by ticket only, tickets will be available from the Arena ticket office for both sets of supporters from around five o'clock, with the BDS Stand ticket office opening around an hour later. Please note that the BDS Stand ticket office is a CASH ONLY office. Should spectators wish to pay by card then they should purchase their tickets at the Arena ticket office. Spectators should arrive in plenty of time to ensure that they purchase their ticket and gain entry to the stadium for the kick off. Turnstiles open for admission at 7pm. There will be on street parking restrictions, therefore it is suggested that buses/minibuses drop off their passengers in Terregles St/King Street and thereafter park on College Mains road just off the roundabout with the A76 on the town bypass (adjacent to Curry's/PC World, as the other side at Aldi is the access road to the ambulance depot and is extremely busy). Pick up should be the same location. Car parking is available in the Arena car park, alternatively there is plenty of other on & off street parking available around the stadium. PLEASE NOTE: A specific search operation due to the time of year and availability of fireworks in addition to pyrotechnics will be in operation so may result in late admission for those who do not allow plenty of time for access. 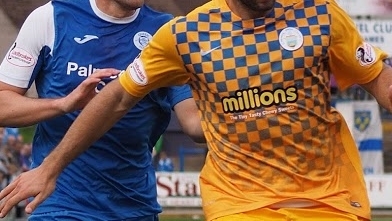 The match at Palmerston on Tuesday evening has a 7.45 pm kick off.